Everything in the universe is made up of energy. All energy vibrates. Differentiation happens because energy vibrates at difference frequencies. Each frequency has a sound. (Actually every frequency IS a sound.) Everything in the universe has a sound which vibrates at its particular frequency. Mantras are the sounds of the language of the universe. Mantras are tuning instruments. If we want to tune into and access a particular universal frequency, we chant the mantra that vibrates that frequency. For instance, chanting MAAAAAAAAAA tunes us into the frequency of the Divine Mother and the sacred Feminine. If we want to tune into the frequency of the sun, we chant RAAAAAAAAAA. When we chant a particular sound, our body and energy field resonate with that frequency. The connection is established and maintained through resonance. Our energy matches and synchronizes with the energy of the sounds we make and the thoughts we think. It is the nature of our energy that attracts to us and creates events, circumstances and environments around us. Much of what we create and attract is produced by our subconscious automatic-pilot programming. Mantras are powerful tools to "de-program" ourselves from old conditioning, to create new programs and to influence our thought patterns. Mantras are also ACCESS CODES to different channels in our mind. Mantras help us open channels that we often cannot access consciously or reach by rational thoughts, or even intent. These universal codes awaken our higher consciousness and make it possible to access higher spiritual connections. Click Here to learn more about some of the key Kundalini Yoga mantras. ONG NA MO GURU DEV NA MO is the mantra we use in Kundalini Yoga to tune us to the frequency of our higher self or inner master. We begin each practice of Kundalini Yoga with this mantra. This sacred mantra opens us to our spiritual channel. It also links us to all the spiritual masters who perfected this sacred science. By establishing a link with the Masters of Kundalini Yoga, we are protected as we practice this sacred technology, as well as guided in our practice. The transmission of information and consciousness to students from Master teachers who have preceded us is referred to as the GOLDEN CHAIN. Yogi Bhajan, Master of Kundalini Yoga, who was the first to openly share this technology with the world, is a connection in the golden chain. Connecting with the Master is of additional importance to those of you who are learning and practicing Kundalini Yoga on your own. By chanting ONG NA MO GURU DEV NA MO, you can be guided in your practice. Actually once you chant the mantra you are guided. The more you are willing to receive and pay attention, the more you will be aware of this guidance. By the way, if you ever dream of Yogi Bhajan, it is not a mere dream. You have tuned into him and his subtle body is coming to assist you in some way. Years ago at a Winter Solstice White Tantric course, a student was very ill from food poisoning. He desperately needed help and tried many ways to get Yogi Bhajan's attention through calling his various names and prayer. He finally chanted Ong Na Mo Guru Dev Na Mo. Five minutes later another student approached him with a bowl of rice and told him "Yogi Bhajan told me to tell you to eat this and you will be better." And sure enough, he ate it and started feeling better almost immediately. Tuning in opens the channel in our mind that receives the highest spiritual frequencies. The mantra that we use is ONG NA MO GURU DEV NA MO. Although this mantra is used specifically for tuning in before practicing Kundalini Yoga, it can be chanted at other times. You can chant it during the day, simply to reconnect with your higher self. You can do it alone as a preparation for silent meditation. Or you can chant it as a meditation for as long as you like. When I taught history and philosophy at International University in San Diego, I also taught a Kundalini Yoga class. The students made up their own harmonic version of this mantra and chanted it walking around the campus. Sit with a straight spine, either in a comfortable cross-legged position on the floor or in a chair with both feet on the ground. A pillow under buttocks prevents slumping and helps keep the spine straight. Sit on natural fabric. HANDS are in prayer pose. Lightly press the palms together flat at the center of the chest, under the breasts, thumbs resting on the sternum. Fingers are pointing up, at a slight angle outward. The pressure on the sternum stimulates the "mind nerve" that connects to the brain. Pressing the palms together balances the two hemispheres of the brain. Both help us concentrate and stay focused. The CHIN is slightly down and pulled back, which straightens the spine, expands the chest and opens the heart center. This is called NECK LOCK. The mantra is optimally chanted all on one long deep breath. It is OK to take a short sip of air through the mouth between the first NA MO and GURU DEV, but it is not permissible to take a long breath through the nose. To prepare, center yourself with your hands in prayer pose and take several long deep breaths. When you are present to your breath in your body and fairly relaxed, you are ready to begin. ONG - Vibrate the sound in the nasal passages, upper palate, back of throat and in the center of the head. Ong is extended and forceful. It is a nasal sound incorporating o, n and g, not oooooong. If properly vibrated it stimulates the pineal and pituitary glands to secrete, which actually opens us up to our higher channels. GURU DEV - Gu is short almost G. Roo (as in Runes) is also short. Deeeeeeeev is extended. Pronounced like the E in Evan. NA MO - the same as the first. Chant at least 3 times, inhaling deeply through the nose before each sequence. The purpose of chanting is to "Tune In." So do it as many times as it takes for you to feel that you are connected to the place and frequency that you need to be in to practice Kundalini Yoga. Chanting this mantra is not a ritual. It creates a specific effect when done properly. After chanting, inhale deeply and hold the breath as long as you can do so comfortably. While holding the breath, go inside and focus on your inner space. This is a powerful moment to be savored. Then exhale. Repeat several times if you wish and then sit silently and turn your senses inward, i.e. look and listen inside. 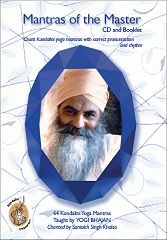 Mantras of the Master as enunciated by Santokh Singh Khalsa is highly recommended by Guru Rattana as a very useful and effective adjunct to our course. After chanting ONG NA MO GURU DEV NA MO, connect with your breath and experience your breathing in your body. One is to simply be with your breath as it breathes in your body. You do not consciously try to change the breath in any way. You are simply with it. After tuning in and after doing each exercise it is best to simply be with your breath. The breath is in sync with the energy in your body and will equalize your energy, come back to your normal breathing pattern or establish a new one. When the breath has stabilized, which often means that it has slowed down, it is appropriate to control or direct the breath. Directing the breath is the second way to use the breath. We modify the natural flow in intensity and duration. After tuning in, is a good time to consciously slow down the breath and deepen it to move it through all parts of your body. Breathing in the abdomen and kidneys is are particularly beneficial. The mind follows the breath. The slower the breath, the more the mind calms down. If we are breathing more than 10 times a minute we are creating stress. (Not true of breath of fire. To be discussed later.) When we slow our breath down to 4 or less breaths per minute, we enter a calm, meditative state. The breath is the perfect tool to help us connect with our bodies. Use the breath to consciously open up energy in your body, to feel the different parts of the body and to stimulate activity. As a culture we are too often in our minds and not present in feeling awareness in our bodies. One of our goals is to use Kundalini Yoga and meditation to help us re-establish a vital connection with our bodies. We are often "out of our bodies" because it is uncomfortable to feel the stress and the pain. We use Kundalini Yoga to cultivate a comfortable feeling in our bodies. Our end goal is to enjoy being in our physical form! One of the features of Kundalini Yoga that makes it so powerful is that we do several things simultaneously. We (1) breathe, (2) internally chant and (3) move in (4) a particular posture or Asana. The internal chant that we mentally vibrate is SAT NAM. As we breathe, we mentally inhale SAT. As we exhale we mentally vibrate NAM. Listen to the sound Saaaaaat and Naaaam in your mind. SAT NAM is a Bij Mantra or a "seed sound." Chanting Sat Nam is like planting a grain of sand in an oyster. Our truth gathers around the grain. Over time, as we accumulate our gifts and gather our true essence into our consciousness, we become the pearl of Self. SAT means Truth, unchanging universal truth. It is the vibration that is ever-present. NAM means name, identity, to name, to call upon, to identify with. SAT NAM means "Truth is my identity." When we chant Sat Nam (out loud or internally), we resonate with our true identity, with our own truth. Greeting others with the salutation Sat Nam, we acknowledge the other's true identity and our mutual divine identities. Sat Nam is a potent affirmation and a powerful way to cleanse the mind of negative programming. Over time our minds tune into and resonate with who we really are and believe our soul instead of our limited ego. Sat Nam is inner psychology at work. Kundalini Yoga is the yoga of awareness. Our goal is to cultivate greater and greater awareness of our own identity and our relationship with our body, others, our environment and the universe. The practice of Kundalini Yoga opens our consciousness so we are able to receive more information and be more present and alert. Simply doing Kundalini Yoga facilitates greater awareness. Optimal practice includes silent, "doing nothing" (passive) periods between exercises, and after tuning in (active) where we pay attention. We sit and sometimes lie down and bring our attention to what is happening without trying to influence it in any way. For maximum benefit, we cultivate awareness by monitoring our energy, how we feel, the sensations in our body and subtle changes that are taking place. In our second lesson on Silence and Intuition we talked about the importance and power of silence. We gave several exercises to cultivate the art of silence. In our next lesson we will discuss Meditation and Choice. The point is that when we learn to be silent, we can actually hear our intuition and make choices that lead us to peace and freedom. Hopefully you have practiced (or tried to practice) silent meditation without preceding it with any tune in techniques. Now try it again but precede it with "tuning in" as described above. Center yourself in your body with your breath. Tune in with the mantra Ong Na Mo Guru Dev Na Mo. Passively be with your breath. Actively slow down your breath to 4 or less per minute. Sit calmly and be silent. Look and listen within. To end-Anchor and consolidate yourself in your body by feeling all your sensations simultaneously, especially places that feel calm. Observe any differences in you ability to focus. It is valuable to monitor the effects of the different techniques, to keep track of what works for you and how you can get the maximum benefits from your practice. On your back, begin rotating your feet and hands In small circles. Continue in one direction for 30 seconds, then in the other direction for another 30 seconds. Cat Stretch: Keeping both shoulders and the left leg flat on the ground, bring the right arm back behind the head and the right knee over the left leg till it touches the floor on the far side of the body. Switch legs and arms snd repeat the exercise. Still on your back, bring the knees up and to the sides, and rub the soles of the feet and the palms of the hands together briskly, creating a sensation of heat. Continue for I minute. Clasping knees to chest with both hands, begin rolling on the spine. Roll all the way back till the feet touch the ground behind the head, and all the way forward till you're sitting up. Do this 3 or 4 times at least. Sit up in easy pose, palms together in prayer mudra at the heart center. Eyes are closed. Inhale completely and say a prayer of thanks. Exhale and let the thought go. A happy conclusion is to sing this song: "May the long time sun shine upon you, all love surround you, and the pure light within you, guide your way on". Repeat. Repeat if you wish. Then chant 3 long Sat Nam's. Saaaaaaaaaat is long and Namis short.